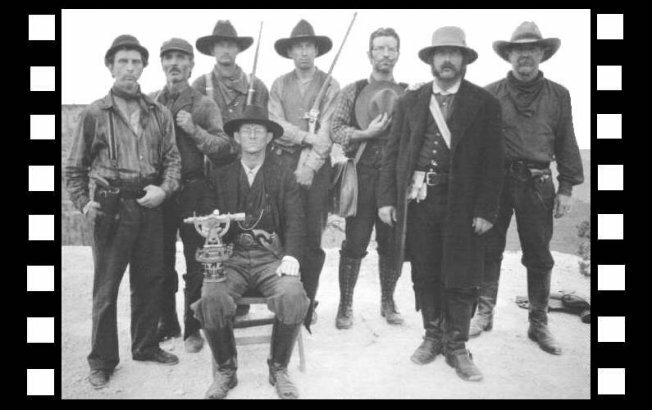 Old West (1800s) Civilians: Cowboys, Ladies, Outlaws, Townspeople, Miners, Etc. AzRAHist Civilians do a variety of images. These include: Cowboys, Outlaws, Towns People, Hunters / Trappers, Miners and more. They can be Mounted or Dismounted, Upscale or Down and Dirty. The above picture depicts a survey party from the 1860's and has an Expedition Leader, Surveyor, Cartographer, Cook and Wranglers. Most of the wardrobe, props and weapons were their own or AzRA's. Our MOUNTED civilians are required to meet the same stringent requirements as our Mounted Cavalry. In fact many of our members do both military and civilian images. Because of the reputation of our riders, they were used as most (if not all, excluding the Stuntmen and Actors) of the Outlaws during the filming of Blind Justice. Our civilians, as with other images, can come ready to outfit or with some/all of what they need. This can include: wardrobe, props, weapons, camp, tack, livestock and etc. AzRA's Civilians can be seen in Riders of the Storm; Deadman, Blind Justice; Far and Away; Bad Jim; Billie the Kid (Unsolved Mysteries); Hardee's Hamburger Commercial; Rambo III; Alamo, Price of Freedom; Geronimo, an Arizona Legacy (KPNX Phoenix) and the Coming Fury.